I decided to go for a twisted updo for the week. I've tried a couple of them on myself before and am finding myself getting better at them. There's lots of inspiration on YouTube, in case you're looking for some yourself. I just kinda made it up as I went along. It took a little less than 2 hours, probably because I turned the tv off and just focused. Perhaps, one day, I will learn how to record and edit videos well enough for tutorials. For now though, I am going to do my best to explain how I went about this. I took a few pics of the process, in hopes of helping you to visualize the process. I was told it looked complicated by a few people, but it really wasn't. 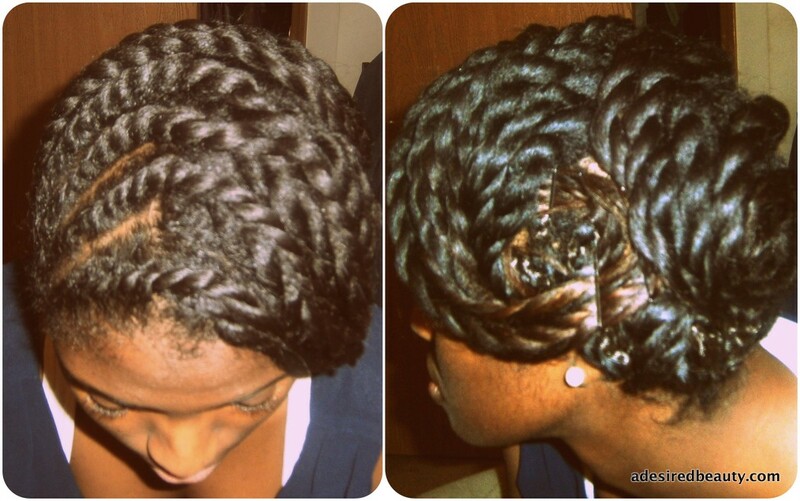 Half of my head is in flat twists, while the other half is in two-strand twists. I started with freshly washed, deep conditioned and air dried hair. After applying my usual leave-ins, I parted my hair a little off-center to divide it into two sections. I divided each section in half by parting my hair from ear to ear. Since I parted it a little off-center, the two sections on the left were a tad smaller than the two sections on the right. 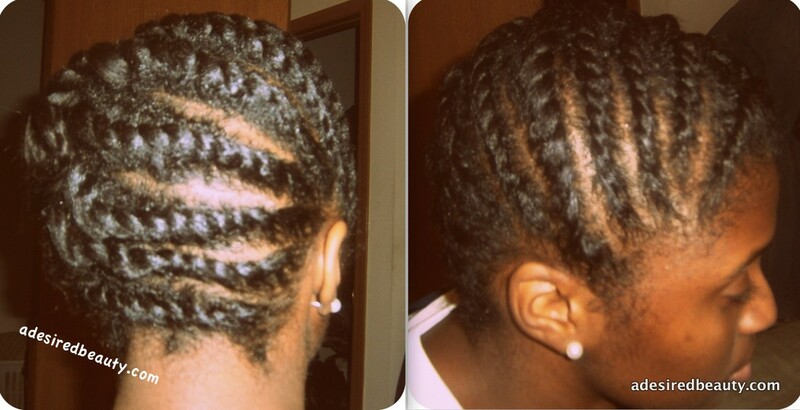 I decided the smaller two sections would be the ones I put in two strand twists so I clipped those up. I started with the front right section, flat twisting it up and to the left. While flat twisting, I applied Shea Moisture's Curling Souffle and Curl Enhancing Smoothie from their Coconut & Hibiscus line (pink label) to each twist. 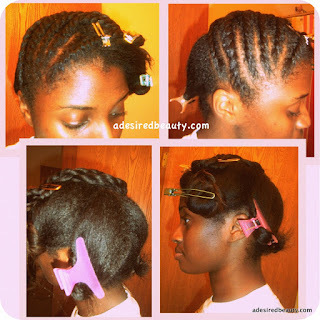 They're great for naturals, and now, I'd say relaxed ladies too! I loved the way my hair felt, looked and even smelled once I was done. My mom, a natural haired lady, uses these along with the shampoo and loves them. I just borrowed for the night. 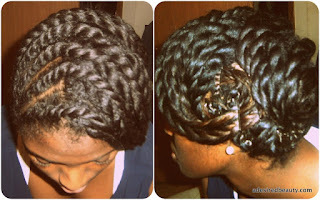 As I finished each flat twist, I pinned it down with a metal clip to ensure it wouldn't unravel. Moving on to the back right section, I flat twisted straight across to the left side. Once I was done flat twisting the right side, I started two-strand twisting the left back section, followed by the front. I didn't have a precise way for going about sectioning each twist. I would say they were medium sized, about the same as the ends of the flat twists. That's it! I tied it all up with a scarf to set overnight. 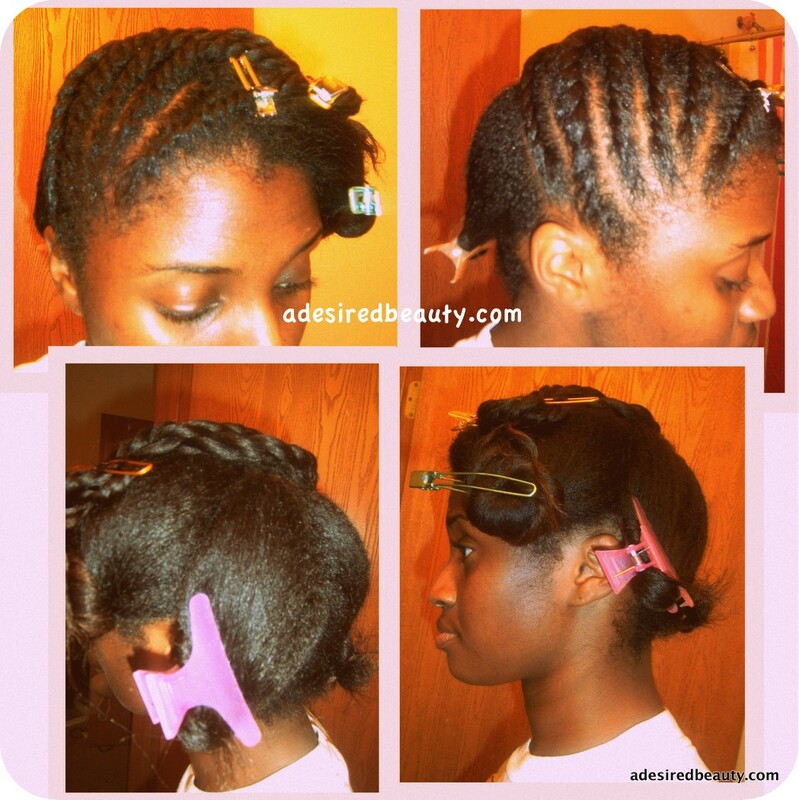 To style, I made three pin curls with the two-strand twists, securing with bobby pins. I moved the pin curls around throughout the week. It held up nicely. I'm planning to try 2-3 more of these types of style for the next few weeks. Not having to style my hair daily was great!